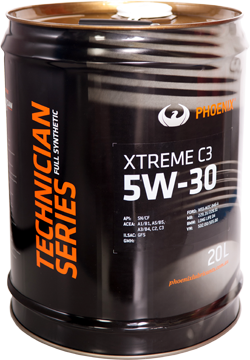 PX Technician Series Xtreme 5W-30 C3 is a fully synthetic engine oil that has been processed using the latest patented technology. Reinforced with a powerful additive package, PX Technician Series Xtreme is ideal for modern high output, low emission, super or turbo charged, DOHC or GDI engines that are commonly found in latest European and Japanese models. With a naturally high viscosity index and low volatility, PX Technician Series Xtreme offers high performance, uncompromised protection to petrol or diesel engines. Due to its excellent anti oxidation property, PX Technician Series Xtreme exhibits extended drain intervals and potential fuel saving. • Superior high temperature protection. • Excellent protection for Diesel Particulate Filters (DPF).